Beautiful morning at Silver Sands Beach. I met Gords, Chad and Kevin at the GSL Marina this morning. We've been having a pretty good turnout the past few swims and it's been fun to swim with new people. There were some big waves cresting and crashing into the rocks near the observation and swells further out. This is the first time I can remember seeing conditions like this. Some of the waves were big enough that I though about trying to body surf on them. If they hadn't been so close to the rocks, I probably would have. I really wanted to play in these waves, but was afraid I would get cut up on the sharp rocks under the water. We swam the usual route to Black Rock. It was fun going up and down with the swells. I hit something near the surface with my hand at one point, but didn't stop to see what it was. The water was murkier than usual this morning. Usually as you get closer to Black Rock you can start to see the sand on the bottom, but I didn't see it at all this morning. I hadn't properly sealed my Safe Swimmer and it had taken on some water. Luckily my phone was inside a plastic bag and didn't get wet. After a quick drink we headed back towards the marina. I was surprised that I was able to stay fairly close to Gords. I don't know if he was taking it easy or if the banana I ate this morning gave me some kind of energy boost or something, because I am usually way behind. I felt great and my shoulder didn't bother me at all. At the mouth of the marina we stopped again. I decided to keep going and finish the 5K route with Gords. After we passed the marina, we ran into some colder water that felt very refreshing. It stayed cool all the way out the the last buoy. 7 miles in 1:16?! In my dreams! I tried out the Endomondo app again this morning and was disappointed by the results. It showed us going 7 miles in 1:16. In reality, we went 3.54 miles in 1:44. I am pretty bummed because I really like how the app integrates into Facebook. 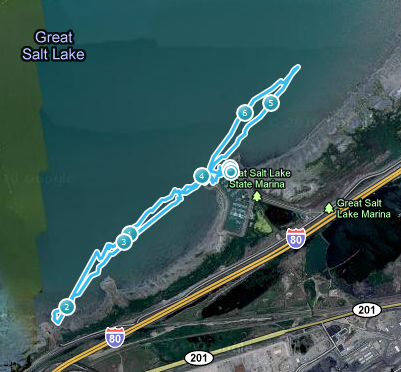 Theoretically, if I was out swimming somewhere, my family could track where I was and watch my progress from home. The app works perfectly on runs or bike rides, but I've had trouble with it in the water. I think the problem may be that I had my phone inside my Safe Swimmer, which was bouncing around quite a bit. New kayak loaded up. Thanks Gords! Gords got me a SWEET deal on a sit-on-top kayak that will hold two or three people. We got it loaded on my car and I headed home. When I got home we unwrapped it and got it all set up. The boys really had fun on it. The weight capacity is 450 lbs, so all four of us should easily be able to ride it at the same time. You can even get a sail for it! I can't wait to take it out on the water! Can't wait to take the new kayak out on the water with the fam. Our next group swim will be Thursday July 21 at Bountiful Lake. We will be meeting at 6:00pm in the parking lot and will walk down to the eastern pier to start the swim. Hope to see you there! Yeah, you're getting faster Josh. I definitely wasn't dogging it. Glad you guys like the kayak. You're boys will have a ball with it as they get older. By the way, where did you hear about a sail kit for this kayak? I found this page which said that the sail kit accessory won't be put into production. But it looks like there should be a motor mount kit available in the future. I am trying to see if I can find one for the tandem on eBay or something. The motor mount could also be cool.